The latest addition to the local craft beverage scene is not a beer or a cider, but something healthy. 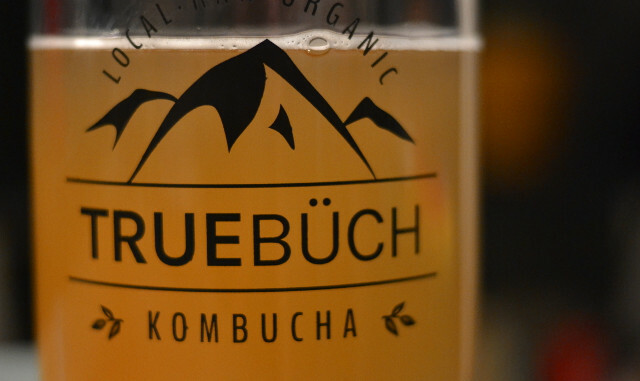 True Buch is a local, kombucha brewery (or KomBrewery), that serves up the tasty drink on tap. The company is operated by a husband and wife duo, Conrad and Louisa Ferrel. The two fell in love with kombucha through their love of travel — they became addicted to the drink while traveling in Asia, and began brewing their own when they returned home to Calgary. For those who are unfamiliar with the beverage, kombucha is a fermented tea drink made from a symbiotic bacteria colony. It’s slightly sour, slightly sweet and a bit fizzy. It’s also chock-full of probiotics. The Ferrels handcraft their kombucha in small batches. The pair are a socially responsible duo; they support small businesses, use organic ingredients and only offer their product on tap with reusable bottles in order to minimize waste. They are working on a model where a percentage of their profits will be donated to local community non-profit organizations. I had the opportunity to chat with Conrad Ferrel about True Buch, and his experience of starting up a small business. Where in Asia did you first try kombucha? Although we were introduced to kombucha in Calgary many years ago, we officially became addicted to it in Ubud, Bali, while on year long round-the-world trip. There were so many restaurants and cafes that carried it, and we just couldn’t get enough! When did you start making the product at home? A few years ago, while doing research on allergies and digestion, we obtained a SCOBY [editor’s note: SCOBY is the symbiotic colony of bacteria and yeast that forms the culture that is the base for kombucha] from a friend’s mom and started brewing at home. We still have the same scoby we started with 5 years ago, and that’s what’s being used for True Buch now. We are a food conscious couple. We grow a lot of our food, and make most of our meals from scratch. We ferment as many things as we can, and kombucha was a natural addition to the mix. Where do you source your ingredients from? (I saw that the ginger in the kombucha that I had a chance to try was sourced from Market 17). All of our teas are organic and supplied locally by The Naked Leaf in Kensington. They have the best selection of organic teas and we have been able to create some amazing flavors using their products. The fruit juices we use in our kombucha are always organic and as often as possible are supplied by great local vendors like Market 17 and the farmers’ market. How difficult was the move from brewing batches for friends and family to brewing on a larger scale? The big change with moving to a larger scale process was moving the operations from our house to a commercial kitchen and getting the process approved by Alberta Health Services. We went from brewing 2 gallon batches to 40 gallon batches and have learned a lot along the way. Photos of True Buch courtesy of Conrad Ferrel. Would you ever sell popular flavours in a pre-bottled form, or are you planning on sticking to the refillable bottle format? One of our core values is that we want True Buch to have as small a footprint as possible. Our Kombucha is only sold in draught form and we want people to either reuse our True Buch bottles or bring their own container for a fill up, creating less waste. We really don’t see ourselves having one-time use bottles available and deviating from this model. What are the difficulties of starting a business with your partner? We are both really opinionated and have had many (many) arguments about decisions that need to be made for True Buch. However, it’s great working together and when it comes to the big picture, we both have the same vision for the company and love working towards a common goal. Have any restaurants shown interest in offering True Buch on tap? We’re in discussions with a few local restaurants who have shown interest, and will hopefully have it available soon. The great thing about kombucha is that the flavors can be tailored to individual retailer needs for mixed drinks, cocktails or just stand alone ‘buch. We would love to expand True Buch to more organic/local stores in the near future. We’ve had a great time so far working with our current retailers and appreciate the engagement they are having in the community by showcasing a local start up business like True Buch. Have you found Calgary to be a supportive place to start a small business? The support has been nothing short of amazing. The people of Calgary seem to be very appreciative of locally based artisan products like ours, and for this we are thankful. We love to be able to meet and get feedback directly from our ‘buch drinkers. The Hillhurst Sunnyside Farmers’ Market has been a particularly great place for us to meet and interact with our customers. True Buch’s draft kombucha is currently available at four locations: Market 17, Wild & Raw Superfood + Juice Bar, Junction 9 Yoga and Pilates, and the Hillhurst Sunnyside Farmer’s Market. The flavours change frequently, and are available in either one or two litre refillable bottles. For more information, you can find True Buch on Facebook, Twitter, Instagram, or on their website.